I’m always sad when I have to throw out a perfectly good ingredient just because I can’t find much use for it at that very moment. I’ve been too cold to contemplate ice cream, and at the moment, there’s no room in my freezer – as it is chock full of fish (courtesy of the lovely folks from the Alaska Fish Council – more on that at a later date). But I bet that if you’ve ever made marshmallows, or meringue, or macaroons (or macarons for that matter, you had leftover egg yolk and you probably wondered how to save it, right? A few weeks ago, when I was elbow deep in testing marshmallow recipes for my hot chocolate addiction, I wound up with quite a few loose egg yolks. I simply stirred the yolks with a pinch of salt, put a piece of plastic wrap on top of the yolks, covered with a lid, and placed the container in the freezer (with a date written on top of a piece of masking tape, which I find to be an indispensable tool in the kitchen). Those yolks will be good for at least about 2 months, and I’m willing to bet that I’ll have that ice cream hankering sooner rather than later. Or better yet, I’ll make lemon curd instead! Awesome! I had no idea you could store yolks that way. I just last week asked this question of one of my cake decorating groups. My white cake only uses egg whites and I hate to throw out the yolks, but never seem to need them around the time that I am baking a wedding cake. The suggestion was also made that you freeze them 1-2 in an ice tray so that you know exactly what volume you have. Gail – not sure, I think it has something to do with keeping it emulsified? I will research that one! Robbie – how about now? Kathy – they should last a couple of months. I’ve gone as long as 3 and they were fine. I like to defrost them in a warm bath. I.e. fill another bowl with warm (not hot) water. Or defrost in the fridge. Timely passover advice! Thank you, I sometimes have dozens of extra egg yokes at this time of year. When you say “stir” as in when you beat them or just gently stir in the salt without breaking the yolk? BTW thank you I never knew I could do this. Can you do this with whole eggs as well? T.R. 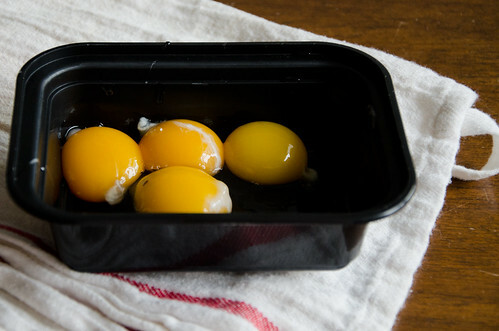 – stir yolks with salt until uniform in mass. Just so they’re emulsified. I don’t think you can do this with whole eggs. I’d have to look up if you can do it with whites. However, you can store whites in a sterilized container in the fridge for up to 1 month – I learned that from a pastry chef. In fact, it’s better to age your egg whites when making any kind of meringue, including macarons, pavlovas, etc. Great tip for a perpetual problem in my kitchen. Never enough time to use up all the yolks from making French macarons in time before they go bad. Thanks! Katie – to be honest, I’ve only used them for ice cream, where you have to strain the custard anyway to make the base. I’ll try my hand with creme brulee and frozen yolks. Also helps to seal them from extra moisture. I froze some egg yolks about a month ago using this method and finally got around to using them for lemon curd yesterday. I fully thawed them out before using, then measured by weight. The problem I had was that I had big clumps of egg yolk when I whisked them together with the lemon juice, etc. I whisked like a madwoman, but I ended up throwing the mixture into the food processor while still hot but before adding the butter. The final product still has little tiny goo balls suspended in it. Perhaps I should have strained it before adding the butter. Any thoughts? Maria – it seems like the straining is the missing piece. Let me do a little research and think on it more. But whenever I make curd or custard, I always strain several times because I hate lumps of any kind in this kind of thing. Sometimes, there’s a lot of moisture in the air that tacks onto the yolk, and extra moisture will get icy and clumpy. That’s frustrating in the same vein as, say, baking the same cake on two different days and getting a different result. I’m traveling next week, but will think on it during my trip! Stay tuned. Hi Olga, this is brilliant. I usually have a few leftover egg yolks and feel pressured to consume it immediately the same week if left in the fridge. Now it’s great to know we can freeze these for longer. Yay! Thanks a lot for sharing this cool tip. baking powder vs baking soda – and “the science of good cooking” giveaway!